Elijah was an Old Testament prophet who ministered to the northern kingdom of Israel about 900 B.C. An account of his life is found in 1 Kings 17–2 Kings 2. He held the keys of the sealing power of the priesthood by which saving ordinances become valid on earth and in heaven. Elijah played a prominent role in restoring those priesthood keys in New Testament times and in our latter-day dispensation. Because of the sealing power restored through Elijah, family members of all generations may be joined in eternal relationships. This chapter will help you better understand the keys of the sealing power of the priesthood and the importance of the coming of Elijah to the success of family history work. In our day, interest in family history work is flourishing around the world, and temples are being built to accommodate an ever-increasing need to perform temple ordinances for all of Heavenly Father’s children. The exercise of priesthood authority in the Church is governed by those who hold priesthood keys (see D&C 65:2; 124:123). They have the right to preside over and direct the Church within their administrative jurisdiction (see D&C 107:9–10). President Joseph F. Smith (1838–1918) explained: “It is necessary that every act performed under this authority shall be done at the proper time and place, in the proper way, and after the proper order. The power of directing these labors constitutes the keys of the Priesthood. In their fulness, the keys are held by only one person at a time, the prophet and president of the Church. He may delegate any portion of this power to another, in which case that person holds the keys of that particular labor. Thus, the president of a temple, the president of a stake, the bishop of a ward, the president of a mission, the president of a quorum, each holds the keys of the labors performed in that particular body or locality. His Priesthood is not increased by this special appointment; … the president of an elders’ quorum, for example, has no more Priesthood than any member of that quorum. 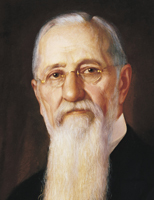 But he holds the power of directing the official labors performed in the … quorum, or in other words, the keys of that division of that work” (Teachings of Presidents of the Church: Joseph F. Smith , 141). “This priesthood holds the keys of binding and sealing on earth and in heaven of all the ordinances and principles pertaining to the salvation of man, that they may thus become valid in the celestial kingdom of God. “During the days of his ministry Elijah held this authority, and the Lord gave him power over all things on earth and that through his ministry whatever was done should be ratified, or sealed, in the heavens and recognized of full force by the Eternal Father. This power effects and vitalizes every ordinance performed by duly commissioned officers holding divine power on the earth. “It is by virtue of this authority that ordinances are performed in the temples for both the living and the dead. It is the power which unites for eternity husbands and wives, when they enter into marriage according to the eternal plan. It is the authority by which parents obtain the claim of parenthood, concerning their children, through all eternity and not only for time, which makes eternal the family in the kingdom of God” (Doctrines of Salvation, comp. Bruce R. McConkie, 3 vols. [1954–56], 2:117). “In the Church we hold sufficient authority to perform all of the ordinances necessary to redeem and to exalt the whole human family. And, because we have the keys to the sealing power, what we bind in proper order here will be bound in heaven. Those keys﻿—the keys to seal and bind on earth, and have it bound in heaven﻿—represent the consummate gift from our God. With that authority we can baptize and bless, we can endow and seal, and the Lord will honor our commitments” (The Holy Temple , 85, 151). Elder Bruce R. McConkie (1915–85) of the Quorum of the Twelve Apostles taught that the sealing power makes all essential priesthood ordinances valid for both the living and the dead: “All things gain enduring force and validity because of the sealing power. So comprehensive is this power that it embraces ordinances performed for the living and the dead, seals the children on earth up to their fathers who went before, and forms the enduring patriarchal chain that will exist eternally among exalted beings” (Mormon Doctrine, 2nd ed. , 683). The Old Testament records how Elijah used the sealing powers of the priesthood to seal the heavens﻿—the sky﻿—resulting in a famine in the land (see 1 Kings 17:1). By that same power he later unsealed the heavens (see 1 Kings 18:41–45). The same priesthood authority seals, or binds, families together. The Bible Dictionary states, “Elijah held the sealing power of the Melchizedek Priesthood and was the last prophet to do so before the time of Jesus Christ” (“Elijah”; see also Joseph Smith, in History of the Church, 4:211; 6:251–52). President Henry B. Eyring of the First Presidency described the power Elijah held as “the greatest power God gives to His children” (in Conference Report, Apr. 2005, 80; or Ensign, May 2005, 78). As Elijah’s ministry drew to a close, he and Elisha, his successor, crossed the Jordan River, “and it came to pass, as they still went on, and talked, that, behold, there appeared a chariot of fire, and horses of fire, and parted them both asunder; and Elijah went up by a whirlwind into heaven” (2 Kings 2:11). 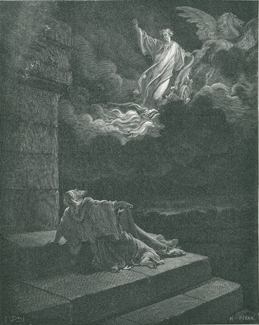 Elijah was translated, or taken to heaven without experiencing death﻿—the separation of his spirit from his body. As the last Old Testament prophet to hold the keys of the sealing power of the priesthood, Elijah needed to retain his physical body in order to later confer those priesthood keys on Peter, James, and John on the Mount of Transfiguration (see Matthew 17:1–3). “The fathers are our dead ancestors who died without the privilege of receiving the gospel, but who received the promise that the time would come when that privilege would be granted them. The children are those now living who are preparing genealogical data and who are performing the vicarious ordinances in the temples. “The turning of the hearts of the children to the fathers is placing or planting in the hearts of the children that feeling and desire which will inspire them to search out the records of the dead. Moreover the planting of the desire and inspiration in their hearts is necessary. This they must have in order that they might go into the house of the Lord and perform the necessary labor for their fathers, who died without a knowledge of the gospel, or without the privilege of receiving the fulness of the gospel” (Doctrines of Salvation, 2:127–28). Elisha witnessed Elijah being taken into heaven (see 2 Kings 2:11). Doctrine and Covenants 2:2 records that Elijah “shall plant in the hearts of the children the promises made to the fathers.” What are “the promises made to the fathers”? President Joseph Fielding Smith taught: “This expression has reference to certain promises made to those who died without a knowledge of the gospel, and without the opportunity of receiving the sealing ordinances of the Priesthood in matters pertaining to their exaltation. According to these promises, the children in the latter days are to perform all such ordinances in behalf of the dead” (“The Promises Made to the Fathers,” Improvement Era, July 1922, 829). Through the sealing ordinances of the temple the promises of eternal family relationships may be obtained. In the Lord’s plan of redemption, one of the earth’s purposes is to be the final celestial abode for those who have made and kept their covenants with Heavenly Father. It will be a place where families can live together forever. The sealing power of the priesthood makes possible the welding together of husbands and wives, parents and children, a work essential for exaltation to the living and the dead. Without the sealing power restored through Elijah, God’s children could not receive the full blessings of exaltation and this purpose of the earth’s creation would not have been fulfilled. 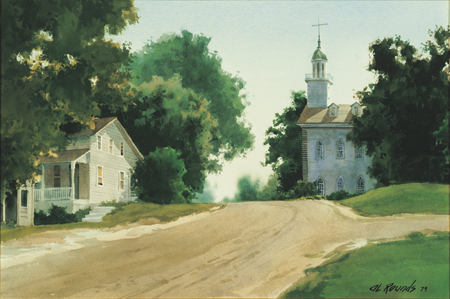 In fulfillment of prophecy, Elijah appeared to the Prophet Joseph Smith and Oliver Cowdery in the Kirtland Temple (pictured here) on April 3, 1836. On April 3, 1836, in the temple at Kirtland, Ohio, Elijah returned in fulfillment of prophecy (see D&C 110 section heading; verses 13–16). Though Elijah was a translated being when he conferred the keys of the sealing power of the Melchizedek Priesthood upon Peter, James, and John on the Mount of Transfiguration, he was a resurrected being when he conferred those sealing powers upon Joseph Smith and Oliver Cowdery in the Kirtland Temple (see Joseph Fielding Smith, Doctrines of Salvation, 2:119). In the unfolding Restoration, the Prophet Joseph Smith had received the Melchizedek Priesthood from Peter, James, and John in 1829, but he still needed the priesthood keys given to him by Elijah in order to seal families together for eternity. In Jewish households that observe the traditional meal at Passover, Elijah “is still an invited guest … , for whom a vacant seat is reserved and the door is opened” in anticipation of his return (Bible Dictionary, “Elijah”). It is interesting to note that the actual return of Elijah, which occurred in the Kirtland Temple on April 3, 1836, was not only Easter Sunday that year but also coincided with the Jewish Passover. President Joseph Fielding Smith explained: “It was, I am informed, on the third day of April, 1836, that the Jews, in their homes at the Paschal feast, opened their doors for Elijah to enter. On that very day Elijah did enter﻿—not in the home of the Jews to partake of the Passover with them, but he appeared in the House of the Lord, erected to his name and received by the Lord in Kirtland, and there bestowed his keys to bring to pass the very things for which these Jews, assembled in their homes, were seeking” (in Conference Report, Apr. 1936, 75; see also John P. Pratt, “The Restoration of Priesthood Keys on Easter 1836, Part 2: Symbolism of Passover and of Elijah’s Return,” Ensign, July 1985, 59; Stephen D. Ricks, “The Appearance of Elijah and Moses in the Kirtland Temple and the Jewish Passover,” BYU Studies, vol. 23, no. 4 : 483–86). President Henry B. Eyring testified concerning the priesthood keys given to Joseph Smith, which include those received from Elijah in the Kirtland Temple: “The keys of the priesthood were restored by heavenly messengers to the Prophet Joseph Smith. They have been passed in an unbroken line to [the current President of the Church]. Those keys are held by each of the living Apostles” (in Conference Report, Apr. 2010, 63; or Ensign, May 2010, 63). President Gordon B. Hinckley (1910–2008) shared a similar testimony: “That same authority which Joseph held, those same keys and powers which were the very essence of his divinely given right to preside, were by him conferred upon the Twelve Apostles with Brigham Young at their head. Every president of the Church since then has come to that most high and sacred office out of the Council of the Twelve. Each of these men has been blessed with the spirit and power of revelation from on high. There has been an unbroken chain from Joseph Smith, Jr., to [the current President of the Church]. Of that I bear solemn witness and testimony before you this day” (in Conference Report, Apr. 1981, 27–28; or Ensign, May 1981, 22). 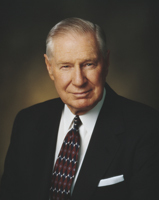 President James E. Faust (1920–2007) of the First Presidency explained one reason why we should all rejoice that the keys held by Elijah have been restored in this last dispensation: “No other religion claims to have the keys to bind family relationships eternally. … Those who cherish their family have a compelling reason to claim the transcendent blessing of being sealed for eternity in the temples of God. For all grandparents, parents, husbands, wives, children, and grandchildren, this sealing power and authority is a crowning principle, a pinnacle in the restoration ‘of all things’ [Acts 3:21] through the Prophet Joseph Smith” (in Conference Report, Oct. 2003, 20; or Ensign, Nov. 2003, 21). Latter-day Saints often talk about “the Spirit of Elijah.” This phrase refers to the workings of the Holy Ghost upon individuals that creates an excitement and desire “to turn the hearts of the fathers to the children, and the children to the fathers” (D&C 110:15) and to be involved in the work of family history. Elder Russell M. Nelson of the Quorum of the Twelve Apostles explained: “What is sometimes called the Spirit of Elijah [is] a manifestation of the Holy Ghost bearing witness of the divine nature of the family. Hence, people throughout the world, regardless of religious affiliation, are gathering records of deceased relatives at an ever-increasing rate” (in Conference Report, Apr. 1998, 43; or Ensign, May 1998, 34). Commenting on this statement by Elder Nelson, Elder David A. Bednar of the Quorum of the Twelve Apostles stated: “This distinctive influence of the Holy Ghost draws people to identify, document, and cherish their ancestors and family members﻿—both past and present” (in Conference Report, Oct. 2011, 25; or Ensign, Nov. 2011, 25). The sealing power not only motivates individuals to pursue family history work, it also enhances the bonds of love found within righteous family relationships. President James E. Faust taught: “Perhaps we regard the power bestowed by Elijah as something associated only with formal ordinances performed in sacred places. But these ordinances become dynamic and productive of good only as they reveal themselves in our daily lives. Malachi said that the power of Elijah would turn the hearts of the fathers and the children to each other. The heart is the seat of the emotions and a conduit for revelation (see Malachi 4:5–6). This sealing power thus reveals itself in family relationships, in attributes and virtues developed in a nurturing environment, and in loving service. These are the cords that bind families together” (in Conference Report, Apr. 1993, 47; or Ensign, May 1993, 37). Elder Richard H. Winkel of the Seventy noted the positive influence of “the Spirit of Elijah” and the temple on his family: “When you come to the temple you will love your family with a deeper love than you have ever felt before. The temple is about families. As my wife … and I have increased our temple service, our love for each other and for our children has increased. And it doesn’t stop there. It extends to parents, brothers and sisters, aunts, uncles, cousins, forebears, and especially our grandchildren! This is the Spirit of Elijah, which is the spirit of family history work; and when inspired by the Holy Ghost, it prompts the turning of the hearts of the fathers to the children and the hearts of the children to the fathers. Because of the priesthood, husbands and wives are sealed together and children are sealed to their parents for eternity, so the family is eternal and will not be separated at death” (in Conference Report, Oct. 2006, 7–8; or Ensign, Nov. 2006, 9). 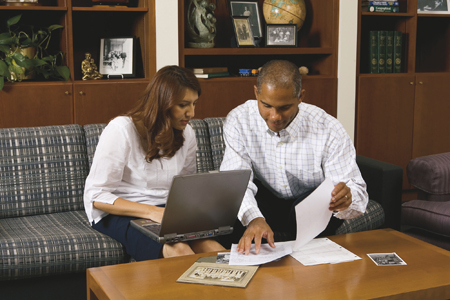 “There are millions across the world who are working on family history records. Why? Why are they doing it? I believe it is because they have been touched by the spirit of this work, a thing which we call the spirit of Elijah. It is a turning of the hearts of the children to their fathers. Most of them do not understand any real purpose in this, other than perhaps a strong and motivating curiosity. “There has to be a purpose in this tremendous expenditure of time and money. That purpose, of which we bear solemn witness, is to identify the generations of the dead so that ordinances may be performed in their behalf for their eternal and everlasting blessing and progress. “The real fruit of this identification finds expression only in the House of the Lord, the temples of The Church of Jesus Christ of Latter-day Saints. And as the work of family history research goes on and grows, there is a concomitant flowering of temples” (“A Century of Family History Service,” Ensign, Mar. 1995, 61–62). “‘Isn’t that the Church that preserves the history and records of our ancestors?’ he said. “He then told me that he and his daughter had spent several years collecting the names of his ancestors and doing family research and had accumulated many generations. He was concerned and wanted to know if he could share that with the Church. He was concerned that all of the work and effort that he had put into accumulating this sacred work could be lost and he wanted to preserve it for future generations. I was happy to share with him the e-mail address and the means by which he could contact the Family History Department and I am confident by this time that he has transferred the information. “Although he does not know why, it is obvious, upon him as upon many others throughout the world the spirit of Elijah is working. To my knowledge prior to the coming of Elijah in 1836 there were no endeavors or any support to search the records of the dead, but what has happened since is miraculous. Laws have been passed in countries compelling the preservation of the records of the dead. In Norway where records were scattered and difficult to find, they have constructed a records vault near the city of Morirana similar to the Church’s vault. They are very proud of it. You can now find family history libraries or locations to find your records in almost every major city or county” (“An Offering, Worthy of All Acceptation” [address at Conference on Family History and Genealogy, Brigham Young University, July 26, 2005], 2–3). Since you are taking a family history class, is it fair to assume you have felt some turning of your heart to your ancestors at least to some degree? In what ways has the Holy Ghost encouraged you to participate in family history? What are your specific interests in family history? In what ways have the sealing keys restored by the prophet Elijah affected your life? In what ways have the hearts of your family members been turned to each other? Do any names in your family ancestry keep coming to mind? If so, have you written these names and these experiences in your journal? What are you going to do about it? Answer the question: What is meant by “the Spirit of Elijah”? Explain to a person or group or in writing the significance of Elijah’s mission for the latter days. Study the scriptures in this chapter that refer to Elijah and his mission. Record what you learn in a study journal. Mark E. Petersen, “The Mission of Elijah,” Ensign, Aug. 1981, 64–65. Russell M. Nelson, “The Spirit of Elijah,” Ensign, Nov. 1994, 84–86. Chapter 26, “Elijah and the Restoration of the Sealing Keys,” in Teachings of Presidents of the Church: Joseph Smith (2007), 307–14.